NASHVILLE, TN, August 01, 2018 /24-7PressRelease/ — Imagine living in Nashville incapable of hearing the music. 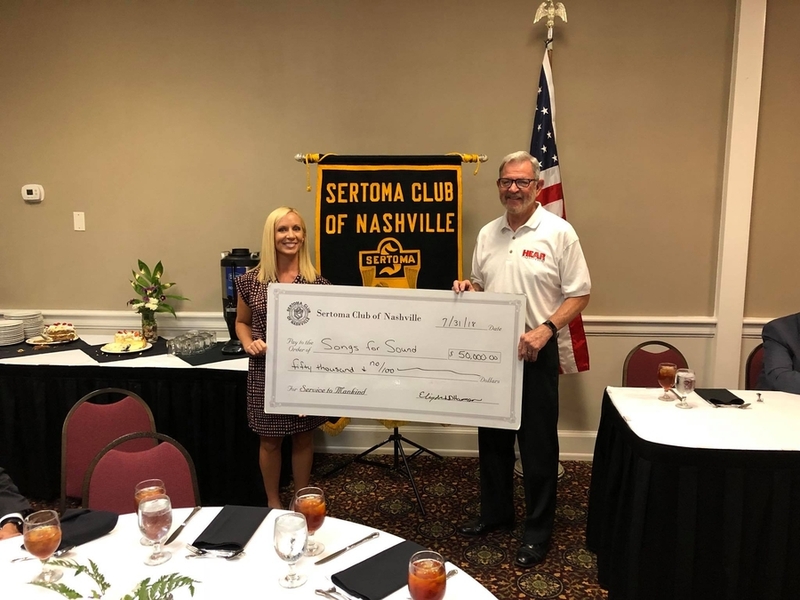 Sertoma’s mission is on point: Service To Mankind. Sertomans across the country are unified with a single purpose: serve communities and improve the lives of those who need help; specifically, improve the quality of life for those at risk or impacted by hearing loss through education and support. Songs for Sound’s mission is to provide AWARENESS of hearing loss solutions, ACCESS to hearing loss screening and devices and encourage ACTION for those suffering from hearing loss and deafness. Songs for Sound aims to provide everyone with an opportunity to live a mainstream life full of sound and language, and of course, MUSIC. Songs for Sound was founded by Kevin and Jaime Vernon of Nashville, Tennessee, parents of Lexi, whose diagnosis of profound hearing loss was originally missed and finally diagnosed at a 1 ½ years old. The Vernon’s learned that Lexi was eligible for a cochlear implant which took their daughter from a world of silence and allowed her to blossom into an active, speaking, and hearing child. Now, Lexi is 10 years old and a stellar student at Christ Presbyterian Academy. Lexi recently played in PGF Nationals as a top fastpitch pitcher in the U.S. for the 10U division. To date, Songs for Sound’s Hear the Music Project, presented by Cochlear Americas, has provided close to 18,000 free hearing screenings and provided direct consultations, packets of checklists and information, hearing technology demos and more. Songs for Sound also offers a free Annual Kids Camp, serves the deaf in Montego Bay, Jamaica and has donated over $200,000 to hearing programs across the USA. To learn more about Songs for Sound’s Hear the Music Project, please visit http://songsforsound.com/events-2/htmconcerts/.